Link to flyer that has all the details below. I was pondering on some of the things in our modern maternity services that impede genuine connections to others. The ability to create, cultivate and build authentic relationships with others lies at the heart of midwifery practice. It is relational continuity and the myriad associated better outcomes for women, families and midwives that inspires continuity of carer models of care. This blog is not about providing more of that evidence, but professional and personal observation of what is going on. Continuity of carer demands that we do not simply fall into autopilot in practice, to follow blindly all institutional dictates, but instead follow women. To do this we need to be open to learning about the other and be willing to cultivate bespoke care pathways in partnership with women. This requires mindful practice to nurture relationships and not blind adherence to what we have been told to do! Being mindful helps our ability to connect with others. I have found that this alleviates stress and tenseness and replaces it with a feeling of relaxed practice. Trying to please the institution and a woman right there in front of you is often really challenging and can trigger our amygdala and initiate a possible flight or fight response. In such a situation the dialogue we are having can become quickly impersonal, emotionally charged, reactive, and defensive. When this occurs, we tend to take a position that makes for a dis-empowering experience for us all there in that moment. In such a situation I would always take a breath, pause and become aware of my own judgements, own up to them and explore them with the woman who has come to me for midwifery care. An example of this could be when a woman at 42 weeks gestation declines induction of labour or a woman decides that a home birth is the best option for her despite a previous caesarean section. For some these situations could be challenging when clinics are busy and/or when we know that we will not be the intrapartum midwife and/or our practice partners do not share the same philosophy of care as me. Challenging for many of us I’m sure. When such occasions arise, I find that a healthy skepticism about institutional dictates helps inform better relational practice. Nurturing discernment around technology and guidelines and being vigilant that they are not owning and taking away the possibility of connection in any moment of practice is key. This is not about bucking the system in a reactive way but concerned with taking responsibility and being accountable for the actions taken in each moment of practice. Most of the time this aware mindful approach to practice creates an opening for honest communication that improves the partnership between us. Through this process I am often brought back into presence with the woman in front of me. In that moment relational continuity flows so much easier and that moment of practice is so much more enjoyable! When we start worrying what the institution or/and others may be thinking of me and the type of care I am providing I can quickly feel tension within me arising again. This is not to promote poor practice, quite the contrary, this is about reinforcing the evidence based relational continuity we aspire to nowadays that consistently demonstrates optimal outcomes! It is about being honest where you are with care, skills and understanding in each individual encounter and doing what is best for the woman, her infant(s) whilst honouring that as midwives we are part of that partnership. For me and many colleagues I speak to, being with women in this way is made so much easier when working within a continuity of carer model. Yet there are seemingly so many obstacles to this occurring. One is the expectation that the ability to multitask is seen as a sign of good midwifery practice and a virtue worth aspiring to. Firstly, there is no such thing as multitasking. Secondly, to attempt to multitask, especially complex multitasking (e.g. several women in labour at once in your care) is a recipe for not doing anything really well! Would you consider crossing a busy road whilst texting a friend and helping a young child to cross good practice? Would that be considered safe? Who is getting the best of your caring aware attention, the child, NO, the person at the end of the text, NO, the drivers and their passengers on the road around you, NO, your own health and wellbeing NO. Yet many maternity units expect professional resilience and capacity to do this level of complex multitasking. Some services expect their continuity of carer, caseload midwives to do this, e.g. manage a busy caseload and be called in to the acute area to help out. This is neither desirable or sustainable. These demands are often driven by staffing and fiscal issues constructed in a world in which maternity services are construed as an industry with ‘outputs’ and ‘products’, these of course are contrary to any idea of relational care. One has to ask who is benefiting from multitasking? Multitasking does not improve care, does not make you a great midwife! It certainly does not prove to you and others that you are a resilient midwife worthy of praise. Neither is it associated with better outcomes! This is not to say that at times we can do simple multitasking (e.g. eat a packet of crisps while walking the dog in the park), but not complex tasks – so we must remain vigilant that we never truly multitask and be aware that constantly trying to do so depletes us emotionally, physically and psychologically, even spiritually. We are never actually multitasking, what we are actually doing is rapidly switching attention from one thing to the other. This itself takes energy to do constantly. Each time we switch attention we are obviously not completely focused on the other – i.e. Moving between birthing women on a shift – who are we truly with completely in any given moment of practice? The outcomes of continuous attempts of multitasking, that is to say, rapid attention switching, in our maternity services leads to burnout, dissatisfaction (of everyone involved) and I would contend, lead to detrimental outcomes in childbirth. Being a multitasking midwife is not the panacea! Being a multitasking midwife does not prove your worth as a good resilient midwife! Being a multitasking midwife is the antithesis of relational continuity. As a phenomenologist and midwife I find the idea of multitasking difficult to comprehend. To be elsewhere in our thoughts and actions means we loose the precious moments in front of us; are we in those times of being absent in our midwifery care missing something special? How can we find our way back to authentic connections when we are constantly interrupted by competing demands? How can we be full participants in the meaningful story of that woman’s childbirth year when constantly distracted by the needs of others and institutions? The magic unfolding when two or more people come into relationship is threatened in our overly busy worlds. Allowing this busyness to enter our moments of midwifery practice is to deny the precious gifts shared and available in our woman-midwife relational encounters. Multitasking in midwifery is a fallacy. There is no evidence to support it, it causes stress, impacts negatively on relationships and takes away our joy of doing what we love to do. Most of us love to be with one woman at a time, be able to be present and fully engaged and give our caring aware attention to her needs. I know this energizes me in practice. In addition, we need to nurture and attend to the needs emerging throughout our unique woman-midwife professional partnership with woman. This requires us to turn up fully and be ‘there’ in each moment of practice. I would urge you all to challenge this pernicious idea of multitasking in the midwifery profession and be a lot kinder to yourselves and others. Karvonen, H., Pakarinen, S., & Torniainen, J. (2016, July). Multitasking and interruption management in control room operator work during simulated accidents. In International Conference on Engineering Psychology and Cognitive Ergonomics (pp. 301-310). Springer, Cham. Loukopoulos, L. D., Dismukes, R. K., & Barshi, I. (2016). The multitasking myth: Handling complexity in real-world operations. Routledge. Rosen, C. (2008). The myth of multitasking. The New Atlantis, (20), 105-110. I have been worried by the social media and media coverage of the New Zealand maternity system lately. Some of the dear David’ comments/responses have been uninformed and sensational, yet many are heart rendering pleas from Midwives wanting financial recognition for the work they do. Rightly so! The NZCOM have asked for solidarity and action. Although I now live in Aberdeen Scotland I know the value and preciousness of the model of care in New Zealand – I also remain very much a New Zealand midwife. So pen to paper I wrote the following email to David Clark (health minister) and Jacinda Ardern (prime minister) at the New Zealand government, and Karen Guilliland the CE of the new Zealand College of midwives (NZCOM). I applaud the NZCOM rapid response to the social media discussions concerning New Zealand’s excellent midwifery services. Having worked in various countries and regions globally, including 10 years as an LMC rural/remote rural midwife in Northland, and a 15 years in the UK system, I wholly support the midwifery led continuity of carer model in New Zealand. It is by far the most progressive model of delivering midwifery care I have witnessed and experienced anywhere. Working in New Zealand as a rural LMC midwife was the best days of my entire midwifery practice. The relationships I was able to build with women, their families and communities provided much joy to my own practice. The evidence on optimal maternal satisfaction, safety and positive outcomes with continuity of carer are clear to everyone globally. Many of us working in midwifery practice development, education and research around the world now look to New Zealand for ways to make the system of continuity of carer sustainable, both for the midwife and the communities in which they work. Empirical evidence clearly shows that sustainable LMC ways of working are possible if the payment and support structures are in place. My own New Zealand study (completed in 2015) clearly showed how NZ rural midwives enjoyed what they do yet felt under pressure to work in unacceptable ways – they just need sufficient paid locum support, back up, and funding pathways that do not penalise them; they need to feel supported by an infrastructure that appreciates the valuable work they do in rural communities. The model is not the problem it is the payment structures. Recent evidence shows that LMCs do very well emotionally and enjoy what they do when supported. To consider changing the maternity model of care in New Zealand would be a travesty. I am now working as a professor of midwifery in Scotland that has had a recent review of all maternity services (Best Start, Scottish Government, 2017). I gave evidence to the policy working group in Scotland on continuity of carer models of midwifery care provision and used the NZ experience as an exemplar. The number one recommendation out of 76 in Scotland’s maternity care reform is: ‘Every woman will have continuity of carer from a primary midwife who will provide the majority of their antenatal, intrapartum and postnatal care…..’. The same recommendation then recommends ‘midwives will normally have a caseload of approximately 35 at any one time’. This recommendation was developed from the evidence and wide consultation with women, families, midwives, obstetricians, neonatologists, managers, researchers and educators from across Scotland. Likewise, a similar review of maternity services from England ‘Better Births’ (2016) recommended continuity of carer for all women based on the evidence and women’s wishes for their care. Currently I am supervising a group of postgraduate research students exploring midwifery continuity of carer implementation in North East Scotland. Many of our senior undergraduate midwives in Scotland are eager to work in continuity of carer practices. In Scotland we are finding and working towards a change that would ensure continuity of carer for all women – something that you in NZ already have. I hope that the NZ ministry of Health takes heed to the international evidence, women’s wishes and policy direction for maternity services. Currently NZ is shining a light on the journey ahead for many global regions – let them not turn that light off. My message to those that read this – make comments, take action get writing, get lobbying today. A blog a wrote in May 2016 about my personal experience in sustainable caseloading in midwifery has been translated by a colleague, Tine Oudshoorn, into Dutch. Er is veel gesproken op sociale media en diverse internationale fora over caseload – verloskunde en werken met persoonlijke continuïteit van zorg (gehele proces) die het model nastreeft. Er bestaat nogal wat opwinding over; veel mythes, misvattingen en ongegronde bezorgdheid gaan rond. Ik had het genoegen in verschillende geboortezorg systemen te werken in het Verenigd Koninkrijk en erbuiten. In het Verenigd Koninkrijk werkte ik in een groepspraktijk met standaard verloskundige zorg en als zelfstandige verloskundige. De standaard verloskundige zorg, waarbij de 1e- en 2e-lijnszorg gescheiden zijn appelleerde eenvoudigweg niet aan mijn behoeften. De groepspraktijk regelingen in de praktijk van het Chelsea en Westminster ziekenhuis, waar ik werkte in de jaren ’90, hoewel leuk in het begin, waren ook frustrerend en putte mij uit. Zelfstandig werken in het Verenigd Koninkrijk was geweldig, maar wel erg stressvol, doordat het niet volledig geïntegreerd is in het zorgsysteem en de noodzaak bestaat om betaling te vragen voor je diensten. In Nieuw-Zeeland waar ik werkte, is de vrijgevestigde verloskundige volledig geïntegreerd in het zorgsysteem, waarbij vrouwen een verloskundige rechtstreeks boeken, zonder betaling als ingezetene of burger van Nieuw-Zeeland. Ik heb het Nieuw-Zeelandse verloskunde systeem al eerder elders beschreven. Ik ga hier niet opnieuw de onderbouwing van caseload – verloskunde opsommen, die vindt je elders. Wat ik hier eerst ga beschrijven is wat persoonlijke continuïteit van zorg voor mij is. Het is ‘het meest’ ter zake doende en meest belangrijke in de contacten tussen de vrouw en de verloskundige tijdens de zwangerschap, de bevalling en het kraambed. Zorg wordt alleen overgedragen aan anderen, als ik op vakantie ben, een weekend vrij heb, bij ziekte of studiedagen en als er twee vrouwen tegelijk gaan bevallen! De zorg die ik verstrek doorkruist risico’s en de gekozen plaats bevalling. Ik volg vrouwen naar de haar geprefereerde plaats bevalling. De regeling is flexibel. Er wordt doorlopend op gelijkwaardige wijze (in partnership) tussen vrouw en verloskundige overeengekomen wat de volgende stap is. • Een uitstekende ondersteunende structuur (netwerk) met collega ‘s. • Gelijkgestemde collega’s die qua filosofie en visie op dezelfde lijn zitten. • Eerlijke vergoeding voor het werk dat ik deed, afgestemd op- en overeenkomend met het niveau van mijn vaardigheid. De betaling georganiseerd door het ministerie van volksgezondheid en gratis voor vrouwen. • Regelmatige verlofregeling in overleg met een vaste praktijkpartner. • Zelfregelend en autonoom werken, zoals het zelf bepalen wanneer prenatale zorg en postnatale zorg gedaan worden. Zelf het aantal volledige begeleidingen per jaar bepalen en de jaarlijkse rustperiode en vrije weekenden in overleg met de vaste praktijkpartner regelen. • Eén volledige maand onafgebroken vrijaf zijn per jaar, plus een week vrijaf in overleg met de vaste praktijkpartner. • Werken in partnerschip met vrouwen, dat wederkerig sensitief was en tegemoet kwam aan beider behoeften. • Gelegenheid en tijd om ‘geen dienst te hebben’ als dat dringend nodig is. • Genereuze open sfeer en goede communicatie tussen collega’s. • Uitstekende werkrelaties met ziekenhuiscollega’s (verloskundigen en artsen). • Regelmatige ondersteuning en begeleiding van de Midwifery Councel en College of Midwives (organisatie van verloskundigen). • Begripvolle familie die ondersteunend is aan mijn manier van werken. • Goede verstandhouding met iedereen (de gemeenschap) in de vestigingsplaats waar ik werkte. • Betrouwbare auto en telefoon! De caseload was 4 – 6 bevallingen per maand. Dat genereerde redelijke inkomsten, iets meer dan collega’s die in ploegendiensten in het ziekenhuis werken. De betaling van caseload – verloskundigen in Nieuw Zeeland zet momenteel aan tot nadenken. Aanpassing is nodig om te voldoen aan inflatie en de mate van de verantwoordelijkheid. Op het moment dat ik dit schrijf staan 4 – 6 bevallingen per maand voor een adequate beloning, maar dit is nog niet verhoogd met de inflatie en daarmee een actuele uitdaging. Ik werkte samen met 8 andere caseload – verloskundigen, opgesplitst in partnerschips van twee collega’s die elkaars partner zijn en waarnemer bij vrije weekends, vakantie- en studiedagen of ziekte. De tweede verloskundige is ook beschikbaar voor primi para bevallingen, of hulp bij langdurige bevallingen of als twee vrouwen tegelijk gaan bevallen! Spreekuur tijden, huisbezoeken en kraamvisites bepaal ikzelf in overleg met de vrouwen. Ik verzet afspraken in overleg met de vrouwen als dat nodig is. Flexibiliteit is de sleutel. Sommige caseload – verloskundigen prefereren het om alle prenatale zorg op één bepaalde dag te plannen en bij voorbeeld nieuwe aanmeldingen, kennismaking en volledige intake, op een andere dag te doen. Partnerschap is van essentieel belang tussen de vrouwen en mezelf, mijn praktijkpartner/waarneemster, de groepspraktijk waar we deel van uitmaken en de bijbehorende ondersteunende diensten, zoals de huisartsen, de geboortehuis staf en de plaatselijke ziekenhuiscollega’s. Hoe ziet een maand werken als caseload – verloskundige eruit? Was ik overwerkt na die maand? Was de doorlopende aanwezigheidsdienst een constante verstoring van- of druk op mijn privé leven? Maakten vrouwen misbruik van mijn constante aanwezigheid en belden ze mij voortdurend? Hieronder één maand van activiteiten uit het dagboek van mijn praktijk. Alle namen en plaatsen zijn verwijderd. Iedere maand was anders, maar dit voorbeeld geeft je een momentopname. • Maandag, dienst. Prenatale zorg in de praktijk 8.00 – 12.00 uur (8 dames). Drie kraamvisites en 1 nieuwe aanmelding, kennismaking en intake aan huis van de vrouw (2 uur). Thuis om 16.30 uur. Geen telefoontjes of oproepen. • Dinsdag, dienst. Vier kraamvisites in de ochtend. Praktijk administratie bijgewerkt in de middag. Geen telefoontjes of oproepen. • Woensdag, dienst. Drie kraamvisites in de ochtend. ‘S middags vrij. Geen telefoontjes of oproepen. • Donderdag, dienst. Prenatale zorg in de praktijk (8 vrouwen). Twee kraamvisites. Praktijk vergadering geannuleerd omdat iedereen bezig was. Om 15.00 uur thuis en om 22.00 uur gebeld voor een bevalling. De volgende ochtend (vrijdag) om 08.00 uur thuisgekomen. • Vrijdag, dienst. Ochtend vrij om te slapen. In de middag 4 kraamvisites. Thuis om 17.00 uur. Mijn praktijkpartner neemt de dienst over van 18.00 – 23.00 uur, zodat ik buiten mijn werkgebied naar een afspraak kan.
• Zaterdag, dienst. Eén kraamvisite. Geen telefoon of oproepen. • Zondag, dienst. Eén kraamvisite. Geen telefoon of oproepen. Totaal aantal uren weg van huis en aan het werk = ca 36 uur. Buiten de werkdagen, maandag tot vrijdag, – één maal gebeld. • Maandag, dienst. Prenatale zorg in de praktijk 08.00 -12.00 uur. Vier kraamvisites. Thuis om 16.00 uur. • Dinsdag, dienst. Nieuwe aanmelding, kennismaking en intake 09.00 – 11.00 uur. Drie kraamvisites. Thuis om 14.00 uur. Geen telefoontjes of oproepen. • Woensdag, dienst. Geen telefoontjes of oproepen. Geen pre- of postnatale zorg. Administratie bijwerken (2 uur). • Donderdag, dienst. Prenatale zorg in de praktijk 08.00 -12.00 uur. Praktijk vergadering tijdens de lunch. Vier kraamvisites. Thuis om 16.00 uur. Neem waar voor mijn praktijkpartner, zodat zij een avond vrij is. • Vrijdag geroepen voor een bevalling om 07.00 uur. Thuis om 13.00 uur. Nieuwe aanmelding, kennismaking en intake 15.00 – 17.00 uur. Gebeld om als 2e verloskundige bij een bevalling aanwezig te zijn 19.00 – 23.00 uur. • Zaterdag, dienst voor mijzelf en mijn praktijkpartner. Haar vrije weekend. Geen telefoontjes of oproepen. Eén kraamvisite. • Zondag, dienst. Twee kraamvisites. Klaar tegen lunchtijd. Gebeld om 17 uur voor een borstvoeding probleem. Totaal aantal uren weg van huis en aan het werk = ca 35 uur met 1 – 2 uur telefonische contacten en de administratie bijwerken. Buiten de werkdagen, maandag tot vrijdag, – tweemaal gebeld. • Maandag, dienst. Prenatale zorg in de praktijk 08.00 -12.00 uur. Vier kraamvisites en één nieuwe aanmelding, kennismaking en intake. Thuis op 17.00 uur. • Dinsdag, dienst. Twee kraamvisites. Niets te doen vanaf 11.00 uur. Geen telefoontjes of oproepen. • Woensdag, dienst. Gebeld om een inleiding te begeleiden (over tijd) om 11.00 uur. Thuis om 23.30 uur. • Donderdag, dienst. Prenatale zorg in de praktijk 08.00 -11.00 uur. Drie kraamvisites. Praktijk vergadering tijdens de lunch. Thuis om 15.00 uur. Geen telefoontjes of oproepen. • Vrijdag, dienst. Vier kraamvisites. Nieuwe aanmelding, kennismaking en intake 13.00 – 15.00 uur. Overdracht aan praktijkpartner om 18.00 uur. Vrij weekend. • Zaterdag en zondag, geen dienst. Totaal aantal uren weg van huis en aan het werk = ca 38 uur met 1- 2 uur telefonische contacten en de administratie bijwerken. Buiten de werkdagen, maandag tot vrijdag, – eenmaal gebeld. • Maandag vanaf 08.00 uur dienst. Prenatale zorg in de praktijk 08.00 -12.00 uur. Vier kraamvisites. Gebeld voor bevalling om 16.00 uur. Thuis om 21.00 uur. • Dinsdag, dienst. Gebeld voor ondersteuning van praktijkpartner bij een thuisbevalling, van 07.00 – 11.00 uur. Drie kraamvisites. Nieuwe aanmelding, kennismaking en intake 15.00- 17.00 uur. Geen andere telefoontjes of oproepen. • Woensdag, dienst. Geen werkzaamheden of gesprekken. De administratie in 2 uur bijgewerkt. Geen enkel telefoontje of oproep. • Donderdag, dienst. Prenatale zorg in de praktijk 08.00 -12.00 uur. Praktijk vergadering tijdens de lunch 12.00 – 14.00 uur. Daarna twee kraamvisites. • Vrijdag, dienst. Drie kraamvisites. Nieuwe aanmelding, kennismaling en intake (2 uur). Perinatale sterfte vergadering in plaatselijk ziekenhuis 13.00 – 15.00 uur. Dienst vanaf 18 uur voor praktijkpartner, haar vrije weekend. • Zaterdag, dienst. Om 6.00 uur gebeld voor assistentie van een collega (lid van de groepspraktijk die we samen voeren). Thuis om 16.00 uur. • Zondag, dienst. Eén kraamvisite. Geen andere telefoontjes of oproepen. Ik hield ervan en floreerde met deze manier van werken. De voldoening die ik had van het relationele model van zorg resoneren nog altijd door in mijn perspectieven op de verloskunde. De relaties gaven mij energie en inspireerde me. Ja, soms was ik moe en wilde niets anders dan mijn telefoon afzetten. Maar dat werd steeds opnieuw goedgemaakt bij de volgende geboorte, het volgende imponerende moment; dat wij als verloskundigen het privilege hebben geïnviteerd te worden een bevalling te begeleiden. Laat de caseload – verloskunde en persoonlijke continuïteit van zorg je geen zorg geven of bang maken. Het was een prachtig deel van mijn werk als verloskundige, dat ik vaak mis, nu ik ben ingebed in de academische wereld. Het plezier van zo te werken, overtrof altijd de momenten van kwetsbaarheid of twijfel. Zorgen voor vrouwen en hen adviseren en uit de eerste hand zien en horen hoe het werkt of niet werkt voor hen, geeft vorm aan praktijk besluitvorming. Het steeds opnieuw vrouwen ontmoeten die gezinnen vormen is een genot. Ik moet zeggen dat caseload – verloskunde echt de kunst en de magie van de verloskunde door vroedvrouwen benadrukt, die mij altijd na aan het hart zal liggen. Wees niet bang voor caseload – verloskunde, het is duurzaam, aangenaam en goed uitvoerbaar met de juiste ondersteuning en flexibiliteit. Ik ken collega’s die na 20 jaar zo werken, het nog altijd even boeiend en inspirerend vinden. Net als collega’s met kinderen, collega’s die net afgestudeerd zijn en collega’s die nooit zo hebben gewerkt in een vrije praktijk. De belemmeringen om op deze wijze te werken worden overwonnen met steun- en de wens- en inspiratie te willen slagen. Wat anderen ervan denken? Zou deze aanpak werken in het Verenigd Koninkrijk? Zou deze aanpak werken als nationale aanpak in bijvoorbeeld Schotland (of Nederland)? Heb je er ervaring mee? Dr. Susan Crowther is hoogleraar verloskunde aan de Universiteit van Aberdeen, UK. Vertaling Tine Oudshoorn, verloskundige, n.p. MA. 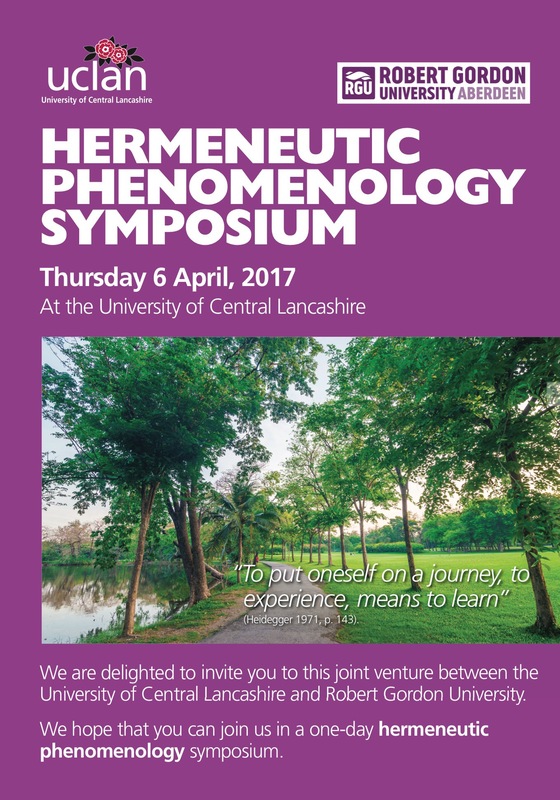 Course and symposium bookings now open. The 2018 April event is in Aberdeen, Scotland hosted at Robert Gordon University. As at the 2017 event Dr Gill Thomson from UCLAN co-facilitates with me! The 2017 event in Preston was fantastic and we are both looking forward to the 2018 one…. see you there. Information on how and where to book a place for the course/symposium is on the attached posters. “Concerning maternity: ethical and existential questions at the beginning of life” hosted by Dr. Inge van Nistelrooij & Dr. Joanna Wojtkowiak. ‘What are existential concerns at the beginning of life?’I was invited to share some of my insights about spirituality, childbirth and existential experience. Needless to say i resonated with this theme! Part of the key note I gave explored the following taken from my chapter ‘Birth as a Sacred Celebration’, In (Crowther, S & Hall, J. 2017 Eds.) 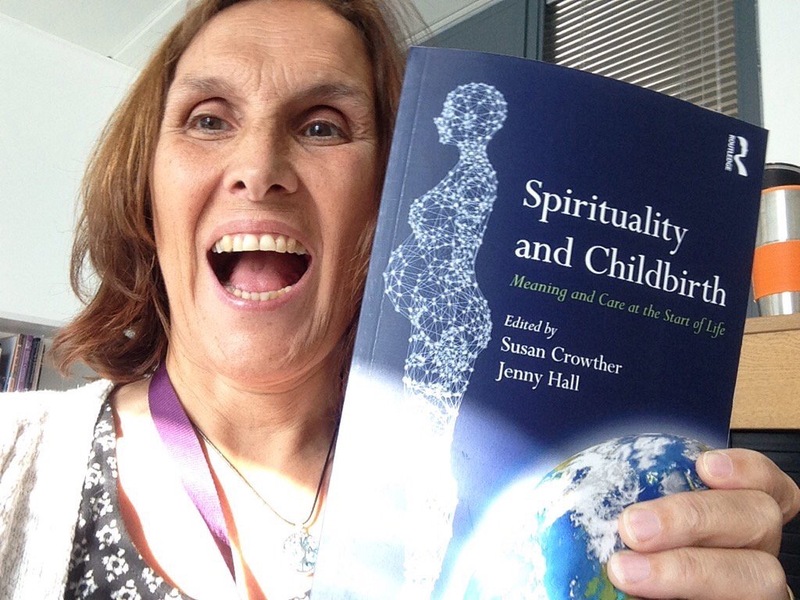 Childbirth and Spirituality: meaning and practice at the start of life. pp. 15-16. I want to share this excerpt from the chapter and presentation in the hope it will generate some dialogue. 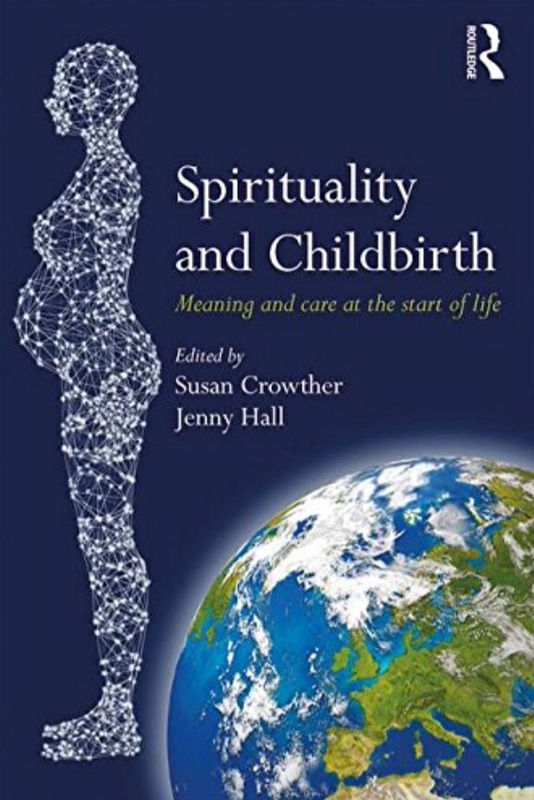 There is a wholeness about childbirth which I to refer to as an ‘ecology of childbirth’ which unfolds at each birth (Crowther 2016, Crowther 2014). Yet we need to be cautious of naming something. The notion of an ‘ecology of childbirth’ (see figure 1) and its implications for how childbirth occurs within contemporary maternity systems is used here as a point of departure in our explorations and is not intended to be taken as a fixed and inflexible notion. According to Haeckel (1986) ecology is the science of relationship of living things/beings and their environments. What is key in this definition of ecology is the significance of relationships. I would contend that ecology in relation to childbirth is concerned with multiple relationships. It is an interrelated phenomenon comprising an embodied quality [i], a spatial quality that includes felt-space and physical places of birth, a quality of relationality or being with others, a quality of temporality that incorporates Kairos time (explored later in chapter), a dynamic quality of social-political and cultural context e.g. changing policies and practices informing childbirth. Simultaneously every birth includes a mysterious unspoken quality unfolding in and around the occasion. This ‘ecology of birth’ incorporates ALL types of birth in ALL circumstances. An ecology of birth is a notion built upon the enigmatic description of Heidegger’s fourfold [ii] (Heidegger 1971/2001), Smythe et al’s (2016) interpretation of the ‘good birth’ and my own research in relation to the existential qualities of lived-experiences of being at the time of birth (Crowther 2014). Reawakening our collective cognisance of an ecology of birth can bring remembrance of how each birth is potentially a joyful celebration of life and our shared natality. I infer a ‘reawakening’ as I fear we have forgotten or covered up our original knowing. In this chapter I adopt a phenomenological and philosophical hermeneutic lens informed by the works of Heidegger (1927/1962), Gadamer (2008/1967), Arendt,(1958) Dilthey, (2002) and O’Byrne, (2010) to present a philosophical interpretation of birth as spiritually meaningful. [i] Embodied experiences refers to how the body is the medium of our perceptions (Merleau-Ponty 1962/2002). Experience and bodily sensorial sensations are thus inseparable. For example a joyful experience is both our material body, such as tears of joy, as well as the lived experiencing of the joy. As Heidegger (2001) contends we body our experiences, that is to say we embody them. (full references given at end of chapter). This is such a lovely blog from a 2nd year student midwife at RGU – I just felt compelled to share! Emma, midwifery is privileged to have you join the profession! This September I finished the first full year of my midwifery course, and so much has happened in that time. I sat an exam, I failed essays and passed essays, I moved into a new flat with 3 fantastic girls, I’ve worked in 3 different hospitals during 4 clinical placements, I set up my own Netflix account and I have delivered 10 beautiful babies. It is now published! Available on Amazon – that was quite a journey. Made wonderful by a team of amazing chapter authors and my lovely friend and colleague Dr Jenny Hall as Co-editor. 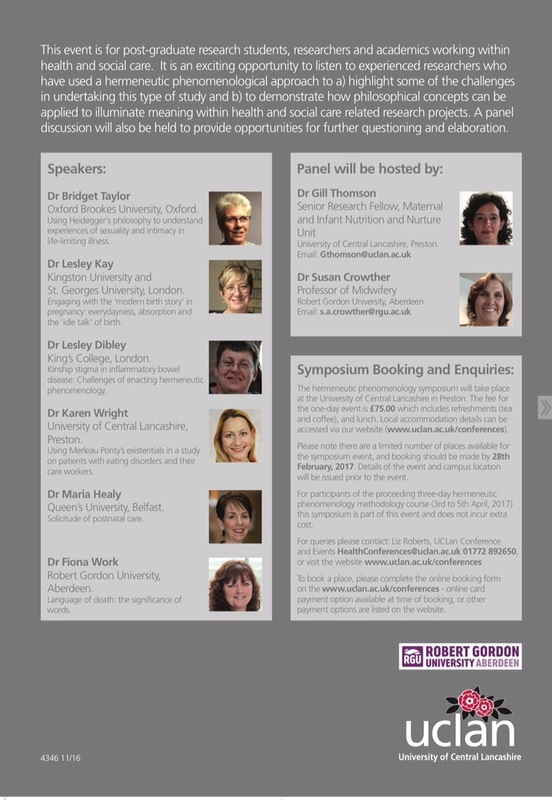 The official launch will be at the Normal labour and Birth research conference early October at Grange over Sands, UK. We hope it brings this conversation to the table or at least begin a conversation. To find oneself, in whatever capacity, in and around childbirth, is to be moved and transformed by an event in human life that is significant on so many individual and societal levels. Enjoy the read and let me know your thoughts. The manuscript for the book has now been submitted to the publishers. Jenny and I are hoping to get the book launched by or during the International Confederation of Midwives conference in June 2017, Toronto.